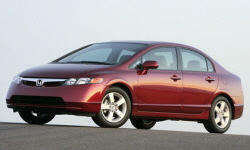 Why the 2006 Honda Civic? Great mileage, though not as great as I had expected. But then again, this is no Hybrid. The 2006 was a redesigned model year and the aerodynamic low sweeping look was an eye catcher and has since been copied by other small cars. The Civic as purchased for under $20,000 was pretty much "loaded". Nice things like alloy wheels and power sun roof were included. This car is a hot seller, so discounts and incentives are virtually non existant. At least so 2 years ago when I purchased it. Perhaps that has changed given the state of the economy today.